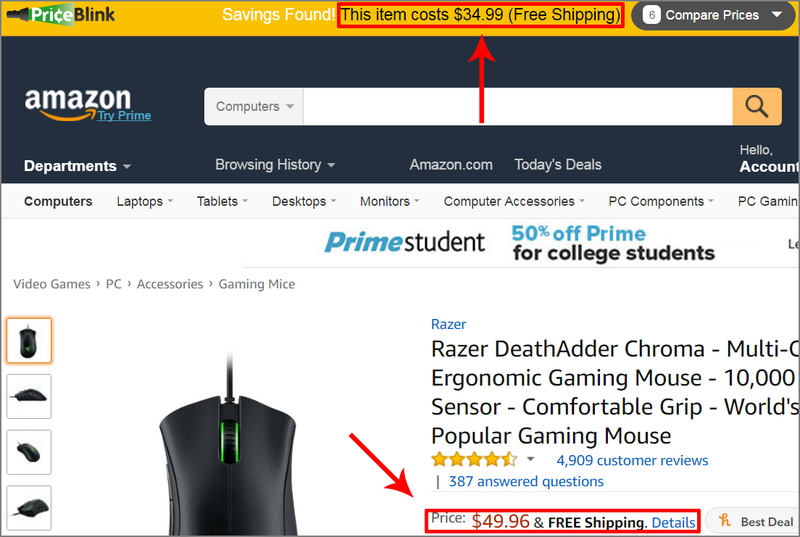 When shopping around for PC components, most of us use the easy pcpartpicker method or just add everything to cart from amazon. But I’m going to outline how to save you up to 30% of your budget that you can either put back into your new rig, or save entirely. I recently followed this technique and I’m going to take you step by step in showing you exactly how to do it. PC hardware is a passion of mine and I always jump at the chance to build a new computer for a friend. But I also own a successful e-commerce business and work for a digital marketing firm as a consultant. This experience gives me an insight into the digital world of trade and I want to use this experience to help my readers save the most money they can when building their new rigs (some of these methods work for anything bought online). You’re going to want to pick up a chrome tool called PriceBlink. PriceBlink allows you to view the same product across a variety of market places. While sometimes PriceBlink won’t give you the best price, it’s a great way to start. Some of these methods will require signing up for a multitude of mailing lists. If you don’t want to get the spam to your primary email, set up a throw away email specifically for these. Prices fluctuate all the time and the key is to snipe the parts you need while they’re at the lowest point. 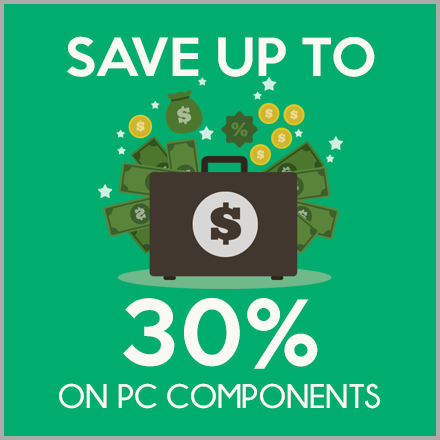 To get the best savings, you’re going to want to be flexible with the components you want. I can understand brand loyalty but if you can save some money and the only difference is the name on the box then it’s worth it. Sometimes we’re in a rush and really need a replacement part. Well you don’t have to wait to still get a good deal on components. This is the quick and dirty method to save a few bucks in no time at all. Most people are familiar with PCpartpicker. If not, it’s really easy to get started. Check out this guide to get familiar with pcpartpicker then circle back here. Figure out what your ballpark budget is going to be and make your ideal computer setup for that budget. If you need help there are some great pre-built lists in their build guide section. Next, you’re going to want to create a list of alternative parts you’re willing to use. The broader you are, the more savings you potentially can get. Save the build and keep note of the price. Find the cheapest vendor recommended by pcpartpicker and follow the link to the product page. Once on the landing page, check PriceBlink for a lower price. Be sure to click on eBays “Check New & Used Prices” and scour the marketplace for a better price. There usually very little risk when getting a manufacturer refurbished component. You might lose out on some accessories (be sure to read the description), but you can end up saving big. I’ve used and sold hundreds of refurbished items without incident and remember, there is always a return policy for big box retailers. Reddit.com/r/buildapcsales – Here you can get some great deals on any given day. Keep an eye out for one of your components or something similar. Craigslist – Don’t be afraid to check out your local craigslist. There are some good items you can pick up cheap. One tip, if you don’t mind being a generation behind, wait until the newest components come out. People often sell off their GPUs to buy the newest and greatest. I picked up a 980ti for about $300 doing this (it works)! Aliexpress – If you’re doing mods or custom loops, check out aliexpress for fittings and plates. You can save a ton if shop around. If you’re not impulsive and can handle the wait, this method works best. The idea is to let the deals come to you. This is where you’re going to want to utilize that throwaway email we talked about earlier. 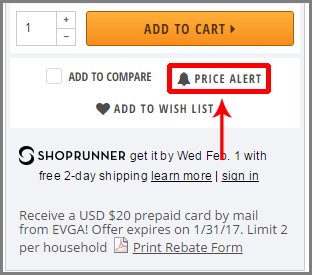 For Amazon price alerts, you can use a site called camelcamelcamel (yes that’s its name) and set a price alert for each item you want. It also gives you the price history of the item and shows when it’s been low. 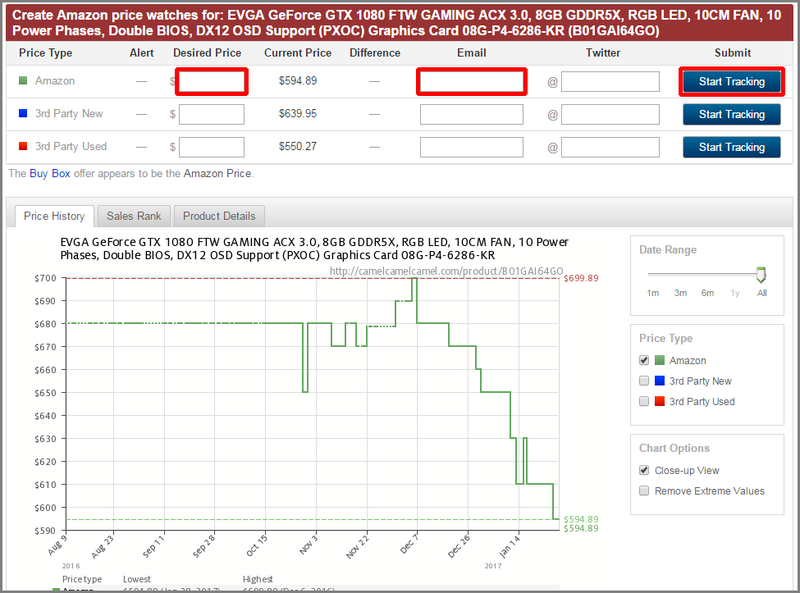 PCpartpicker has a price alert system, although I haven’t found success with it. You can navigate to this feature by going to “Price Drops” in the top right nav menu and then select “sign up for price drops via email.” Alternatively, here is a direct link. 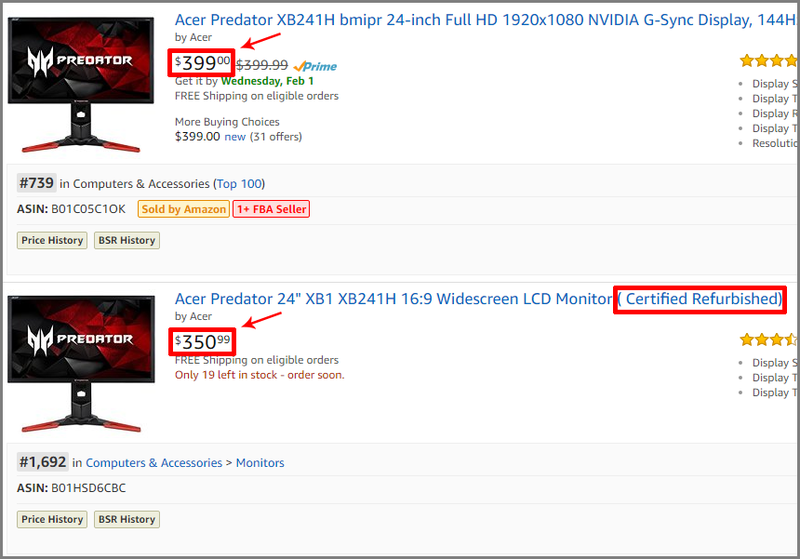 Newegg also has a price alert built into their website. It’s very simple to use just enter your desired price and wait for the email. Take advantage of it and watch your email list daily as most of the best deals don’t last long. Business Insider estimates the abandonment of carts is up to 72%. Retailers and brands utilize retargeting to help them convert these carts into customers. If you’re signed up to a website and add an item to your cart. If you leave that cart empty you’ve probably noticed an email you get a few days later reminding you of that abandoned cart. Sometimes retailers will send you a coupon code to take a percentage off your cart if it’s abandoned long enough (usually 7 days). Try adding all of your components to carts while you’re signed in, then just wait it out. This works for both the slow and fast method and can save you a few bucks. Say you catch a good deal on an item from one retailer at say $85 but the shipping is $15. You can submit a price match for sites like NCIX and Newegg to match that $85 but then if they offer free shipping you save 15%. Don’t rush into buying the next best thing unless you don’t mind paying top dollar. Being smart with your money can save you big if you’re patient and wait for the right moment. Do your diligence and you can save a ton or get the biggest bang for your buck. If you found this guide helpful consider sharing it with your friends who might be in the market for a new PC. If you want to support us, consider using our Amazon affiliate link while shopping on Amazon. As an Amazon Affiliate, we earn commissions from qualifying purchases.